Iowa's delectable cuisine is quintessentially midwestern, grounded in its rich farming heritage and spiced with diverse ethnic influences. Classics like fresh sweet corn and breaded pork tenderloins are found on menus and in home kitchens across the state. At the world-famous Iowa State Fair, a dizzying array of food on a stick commands a nationwide cult following. From Maid-Rites to the moveable feast known as RAGBRAI, discover the remarkable stories behind Iowa originals. 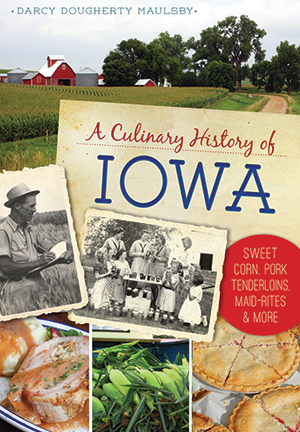 Find recipes for favorites ranging from classic Iowa ham balls and Steak de Burgo to homemade cinnamon rolls—served with chili, of course! Author Darcy Dougherty Maulsby serves up a bountiful history of tasty tradition. Darcy Dougherty Maulsby is an independent marketing specialist and the author of Calhoun County with Arcadia Publishing. For more info, visit www.darcymaulsby.com.